One of the best upper back exercises are wide grip seated rows. This exercise is a great compliment to bench press training as it’s very similar to the opposite of bench pressing. – Keep your eyes and chin up. Most women will look down or round the upper back. Keep good posture. – Focus on driving the elbows back & squeezing the muscle. 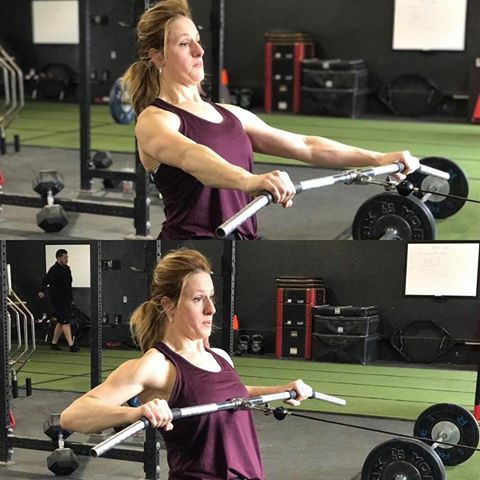 It’s important to pull the bar towards you, but you may get a better contraction and mind body connection by focusing on driving the elbows back. – Use Straps. If grip is an issue on this use staps. This is not a grip focused exercise so be sure your grip is not the limiting factor here.